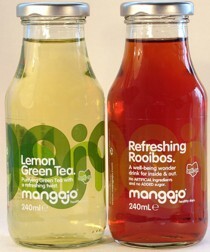 Mangajo drinks are a great refreshing way to hydrate your body with all sorts of goodness. Packed full of natural detox ingredients Mangajo will help your body flush out all those free radicals in the process. Mangajo comes in five no added sugar flavours – Pomegranate & Green Tea, Lemon Green Tea, Refreshing Redbush, Goji Berry & Green Tea, Acai Berry & Green Tea all of which are flavoured with fruit juice. The sixth flavour Kombucha does contain some added sugar, although this is kept to a minimum. I experienced my first taste of Mangajo during a shopping spree to Waitrose, I chose the Pomegranate & Green Tea flavour and it was delicious so I’ll definitely be going back for more. Are you sure that these drinks don’t contain added sugar bar the one? I thought it’s mainly sugar and not much else…. I just checked on the website and all Mangajo drinks are sweetened with fruit juice so no added sugar. Hope that helps.